Taiko no Tatsujin 11 arcade machine is the eleventh version in this series of drum music arcade game machine, which requires two players to play the drums with rhythm when symbols appear on the screen. The player uses a simulated taiko drum controller to play the notes of a chosen song's drum part as they are displayed on the screen. This version features over 100 songs from a range of genres, including JPOP, Anime, Kids songs, Namco Originals, Classical, and Video Game themes. The most obvious change even before you start playing is the position of the drumsticks, which are no longer placed by the side, but in a bag under the drum, making things neater and allows players to place things in between the two drums. In the game, Revival Roulette, which allowed players a chance to continue after failing one song, has been removed and replaced with the less luck-based Revival Drumroll. In this, Don-chan will be placed in front of many plates of food, and your job is to make him finish all the food by hitting the drum face as many times as you can in the time limit. If Don-chan finishes, you get a second chance. Of course things are a lot harder the higher your difficulty level is. Different Taiko sounds, like tambourine sounds, giant Taiko sounds, and farting sounds, have been included in console Taiko games for years, but this is the first Taiko arcade to have a few of the most popular ones. They are accessed by hitting the left rim on Kantan in the difficulty select screen. Kantan has also been given an overhaul, with a much prettier results screen and encouraging messages to players after clearing a song (since Kantan is usually played by very young children). A few select songs in Kantan (the easiest anime songs and children songs) are also compatible with the new Papa Mama Support mode, which allows parents to assist their child in playing on the second drum even though only one player's worth of coins is inserted. Two drum inputs into a single player then. And for the expert players, the addition of Ura Oni mode was the most important addition of them all. By entering a secret command for Ura Oni, a few existing songs were upgraded to even higher difficulty, and some replaced with full versions lasting 4 to 5 minutes long! Ura Oni has been a great source of Taiko challenge ever since this arcade. 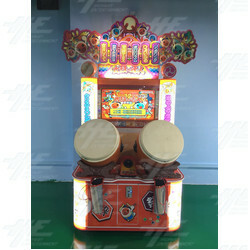 Taiko no Tatsujin 11 arcade machine is the eleventh version in this series of drum music arcade game machine, which requires two players to play the drums with rhythm when symbols appear on the screen. The player uses a simulated taiko drum controller to play the notes of a chosen song's drum part as they are displayed on the screen. This version features over 100 songs from a range of genres, including JPOP, Anime, Kids songs, Namco Originals, Classical, and Video Game themes. The most obvious change even before you start playing is the position of the drumsticks, which are no longer placed by the side, but in a bag under the drum, making things neater and allows players to place things in between the two drums. In the game, Revival Roulette, which allowed players a chance to continue after failing one song, has been removed and replaced with the less luck-based Revival Drumroll. In this, Don-chan will be placed in front of many plates of food, and your job is to make him finish all the food by hitting the drum face as many times as you can in the time limit. If Don-chan finishes, you get a second chance. Of course things are a lot harder the higher your difficulty level is. Different Taiko sounds, like tambourine sounds, giant Taiko sounds, and farting sounds, have been included in console Taiko games for years, but this is the first Taiko arcade to have a few of the most popular ones. They are accessed by hitting the left rim on Kantan in the difficulty select screen. Kantan has also been given an overhaul, with a much prettier results screen and encouraging messages to players after clearing a song (since Kantan is usually played by very young children). A few select songs in Kantan (the easiest anime songs and children songs) are also compatible with the new Papa Mama Support mode, which allows parents to assist their child in playing on the second drum even though only one player's worth of coins is inserted. Two drum inputs into a single player then. And for the expert players, the addition of Ura Oni mode was the most important addition of them all. By entering a secret command for Ura Oni, a few existing songs were upgraded to even higher difficulty, and some replaced with full versions lasting 4 to 5 minutes long! Ura Oni has been a great source of Taiko challenge ever since this arcade.